N.B. : the number of seats being very limited, we advise that you may book as soon as the box office is open. 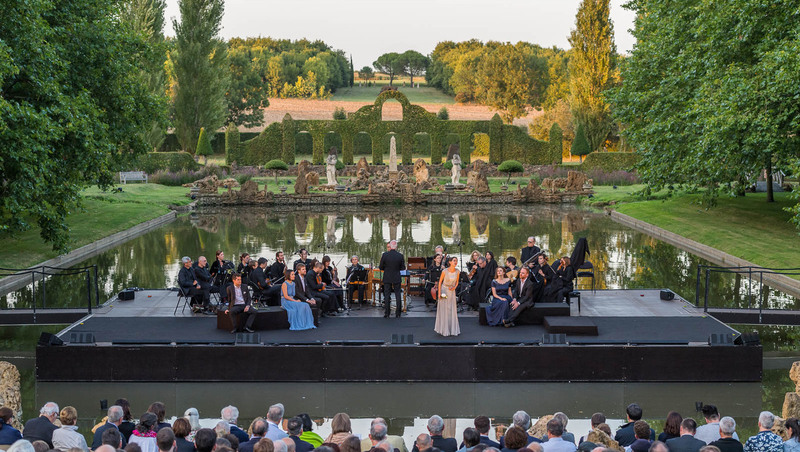 The festival Dans les Jardins de William Christiewas created in 2012 out of a common desire of the Conseil Départemental de la Vendée and of Les Arts Florissants. With one aim: to create a unique event which would bring together music and gardens, and to highlight the magnificent site in Thiré in order to make it known to a large public. Considered to be the first opera in the history of music, Monteverdi’s Orfeo tells the story of Orpheus and Eurydice from the pleasures of Arcadia to the sorrows of the Underworld. This production – unveiled in 2017 at the Théâtre de Caen and the Philharmonie de Paris, which went on to enjoy resounding success in London and Madrid – marks Paul Agnew’s début on the Festival’s emblematic stage. The costumes and décors inspired by the paintings of Nicolas Poussin will find their perfect setting in these idyllic surroundings. Written by John Gay in 1728, The Beggar’s Opera is generally considered to be the very first Musical almost 300 years before this genre became fashionable. By creating a story out of pre-existing songs, John Gay gathered some of the most famous tunes of his time, both classical and popular, and integrated them into a strongly satirical tale which takes place amongst the thieves, pimps and prostitutes of old London Town. For this new production, first performed earlier this year at the Théâtre des Bouffes du Nord in Paris before going on an international tour, William Christie and Robert Carsen have concocted a perfect blend of the Baroque in the 21st century. Both funny and irreverent they have created a very contemporary Beggar's Opera with a team of singers and dancers of astounding vitality. Production C.I.C.T. - Théâtre des Bouffes du Nord • Coproduction Les Arts Florissants avec le soutien de CA-CIB ; Angers Nantes Opéra ; Opéra de Rennes ; Les Théâtres de la Ville de Luxembourg ; Opéra Royal / Château de Versailles Spectacles ; Grand Théâtre de Genève ; Théâtre de Caen ; Edinburgh International Festival ; Festival di Spoleto ; Centre Lyrique Clermont-Auvergne ; Opéra Royal de Wallonie-Liège ; Opéra de Reims / La Comédie de Reims CDN ; Teatro Coccia / Novara ; Teatro Verdi / Pisa ; Attiki cultural Society / Athènes ; Cercle des Partenaires des Bouffes du Nord ; Avec le généreux soutien de la Fondation KT Wong. A true connoisseur of this masterpiece of sacred music, William Christie will conduct young musicians from New York’s Juilliard School at this concert. After performing the entirety of Monteverdi’s madrigals, Paul Agnew is once again conducting his faithful madrigal singers in an a cappella performance of a work by another composer, Carlo Gesualdo (1566–1613). Less well-known than his contemporary and compatriot, Gesualdo is nonetheless the author of some supremely beautiful sacred music, in particular his Tenebrae Responsory for Maundy Thursday, which Agnew has chosen for this concert. Written at the ducal court in Weimar, these Bach cantatas mark a new stage in Paul Agnew’s exploration of the works of this legendary composer. After each evening concert, all are welcome to finish their long day at the festival in a moment of calm and contemplation at the village church in Thiré, where a short program of sacred music will be performed. Tickets to the Méditations cannot be bought separately from the concert that precedes them. Every afternoon, singers and musicians present short concerts in different parts of the garden. Participative workshops for families, animated by artists from the Festival with links to the evening concerts. Tours of the gardens in French or in English and thematic lectures given in one or two voices by enthusiasts of the gardens, garden specialists, art historians and authors.